Book Review Still Lifes, Portraits and Parts By Daniel Gordon Reviewed by Adam Bell How does one deal with the cacophonous overflow of images we are faced with everyday? The anxiety induced by photography's profligate nature have been present since its invention and only grown with its mechanical reproducibility and the concurrent growth of the mass media. In some ways true, it's also a recurrent anxious tic, a lazy refrain. Daniel Gordon's work does not explicitly deal with the problem. Instead, like many artists, he deals with the aftermath. Still Lifes, Portraits and Parts. By Daniel Gordon. Morel Books, 2013. Morel Books, 2013. Hardbound. 102 pp., color illustrations throughout, 10x8". How does one deal with the cacophonous overflow of images we are faced with everyday? The anxiety induced by photography's profligate nature have been present since its invention and only grown with its mechanical reproducibility and the concurrent growth of the mass media. In some ways true, it's also a recurrent anxious tic, a lazy refrain. Daniel Gordon's work does not explicitly deal with the problem. Instead, like many artists, he deals with the aftermath. His work mines the scraps and detritus of our obsessive image culture – the forgotten images on Flickr, the lost or barely glanced at images on personal sites, the uploaded selfie or the images tucked away in the back corners of the web. Culled from photographs online, the printed, torn and distressed fragments that form Gordon's cubistic sculptures and images come together to form volatile images of beguiling beauty. 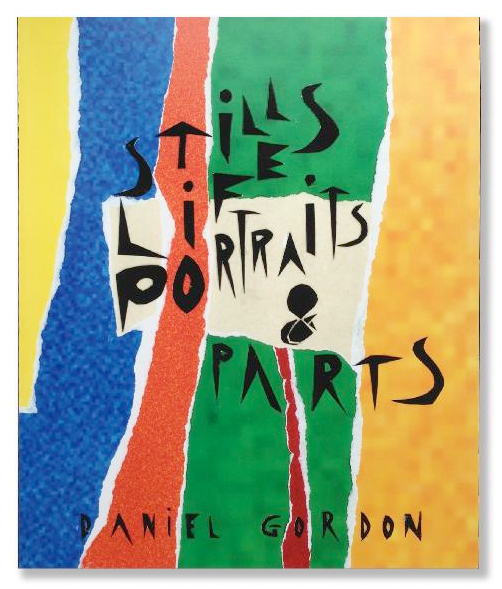 Still Lifes, Portraits and Parts, by Daniel Gordon. Published by Morel Books, 2013. Still Lifes, Portraits and Parts brings together a collection of Gordon's images that fall under these classic, and one less classic, categories. Visually referencing a heady mix of Picasso, Matisse and DeKooning, Gordon's disorienting portraits and still-lifes pull together image fragments from multiple sources. An ear here, a nose there and a mouth from over there. Typically found through a common Google image search, the photographic pieces are then printed out, torn, taped and reconfigured in the studio. Gordon then photographs these sculptures only to break them down, tear them apart and reuse the images once again. Gordon never hides his own hands. Messy and at times sloppy, the torn images reveal their own fragmentary nature, their tattered edges, and seem on the verge of collapse. The grotesque faces and fruit struggling to coalesce or hold steady before falling apart again into piles of paper. Of Gordon's three subjects, it is the 'parts' that are the most compelling. Seemingly empty, the photographs often are often just piles of paper or contain an ear or nose popping out of a boxy empty space. They are the cast aside parts, the half deconstructed remains of the surrounding images. In one image an ear, supported by a thin armature, hovers expectantly and casts a nose like shadow on a vaguely outlined face. Seen alongside the portraits, they appear like empty stages – the oddly grotesque women and men have stepped aside, leaving behind a nose, ear or hair, or simply wait to enter stage right. In contrast to the often-disturbing portraits and disruptive emptiness of the parts, the still-lifes are the most serenely calming of the images. Flowers and perplexing pineapples unfold and implode. Like the spatially mystifying apricots and apples of Cezanne, the rainbow-tinged fruit of Gordon's pictures transcend and transform their humble subject and exhibit an odd density and volume all their own. The book is beautifully printed and bound with an exposed spine that reveals the stitching. Under a dust jacket that looks like a forgotten Matisse catalog or artist's book, the white cover is subtly blind-stamped with the title. Like the dust jacket, the entire book pulsates with chromatic intensity. Cold blues, rancid red and sickly yellows. Colors, like the fleshy tones of his portraits, are often inverted, adding to their disruptive and spatially disorienting nature. The bright primary colors are unrelenting. In contrast with the often muted and polite colors of much color photography, these images are positively rude. The book concludes with an essay by MoMA curator Eva Respini. Starting with an anecdote about visiting the Metropolitan Museum of Art with the artist, Respini recounts her discussion with Gordon about the role of the lens-based artists in the midst of proliferating images. She then goes on to discuss Gordon's work. Although not immediately apparent, the essay's endnote reveals its structure. Cobbled together from various writings on contemporary photographer's work, the essays is actually a patchwork of Respini's own writings – repurposed and altered by simply swapping out the original artist's name for Gordon's. Respini also acknowledges the essay's inspiration, Jonathan Lethem's brilliant essay "The Ecstasy of Influence," which addresses issues of influence, originality, appropriation, copyright and remix culture by creating a patchwork of other author's writings on the subject. (If you've never read it, stop what you're doing and read it now.) While the recycled words speak powerfully about Gordon's work and smartly play off his own collaged technique, it's a touch disheartening that the writings about other artist's work can be so easily repurposed. However, as a tongue-in-cheek pastiche, it's a brilliant piece that addresses both Gordon's work and playfully critiques the often redundant and moribund art writing that dominates wall-texts and catalog essays.